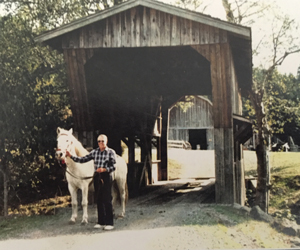 Fred Bollinger stands with a horse next to a covered bridge circa 1970. Courtesy photo. On Wednesday, October 12th 2016, Fred Bollinger celebrated a milestone day. Bollinger turned 100 years old, officially able to take on the title of centenarian. Bollinger has lived in Sebastopol his entire life spending the majority of his life on a farm three miles from the city’s center. Bollinger’s great grandfather emigrated from Switzerland in the 1800’s and settled in Kansas. Bollinger’s father, David King, moved to California in the late 1800’s. “My dad just got up one morning and said ‘I’m not going to stay here’ and came to California,” said Bollinger. David King traveled to San Francisco, and although Bollinger guesses he took a train westward, he said his father never spoke about he got to California. David King married Ruth Anne Gregson who was born in Green Valley and the couple had four children: three sons and one daughter. David King and his wife purchased four acres of land with a small cottage on it in 1909. They purchased an additional 14 acres around 1917 and rented 20 more acres for many years. The Bollinger family purchased the 20 acres during World War II in 1942. 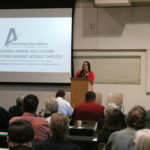 Bollinger’s sister married right out of high school and moved to Alaska to join the fishing community, which Bollinger described as a very successful endeavor. Bollinger and his two brothers stayed in Sonoma County and took over the family farm. The farm, totaling 38 acres, grew both fruits and vegetables, although the majority was planted with apples. The family grew apples, cherries and berries as well as corn, tomatoes and potatoes with another smaller garden around their home. They sold the fruit to packing houses, but as times changed, they sold more and more fruit to canneries and driers until all their fruit went to the canneries. They cultivated the property with horses, and Bollinger recalled almost always having three on the farm. In the summer, they would hire seasonal workers to pick the apples, and Bollinger recalled that many of these workers came from the valley to escape the heat and pick apples in the foggy mornings. Bollinger remembers a particular man who came back multiple years in a row. The man had no teeth and crushed his own apples so that he could eat them; Bollinger and the other farm workers nicknamed the man Apple Sauce. Bollinger said he had the best job on the farm: he was in charge of hauling the fruit from the farm to the different plants. He particularly enjoyed the job as it allowed him to meet and talk with the other farmers. In addition the transporting fruit, Bollinger was also responsible for spraying the crops. He remembered spraying the crops using a hose nozzle, but after the war he got a blower that had a sprayer on it. His least favorite job was always picking up brush and then hauling it off and burning it. Bollinger, alongside one of his brothers, sold the farm in 1981. 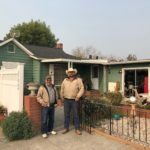 Bollinger and his late brother moved into a house in downtown Sebastopol where he still lives. Bollinger was never married, saying it ran in the family. One of his brothers was also never married and he had many uncles and other relatives who never married. In his retirement, Bollinger is still active participant in the community. A four year WWII veteran, he is involved with the veterans’ association. He has been a member of the Native Sons of the Golden West, an organization of men born in California whose mission is to preserve the state’s history, for more than 65 years and still attends meetings. Bollinger has also been involved with the Luther Burbank Experiment Farm for many years. He said for a while his title was “chief gopher catcher”, something they called him because he caught so many rodents. Bollinger said he recycled the gophers by freezing them and sending them with a vet who dropped them at the wildlife center. At the Luther Burbank Experimental Farm, Bollinger is also involved with maintaining the nursery. Bollinger volunteers every Wednesday, and is passionate about continuing his work there. Bollinger recalls seeing Luther Burbank himself in 1923 when the horticulturalist planted a tree at the Pleasant Hill School. Bollinger was also involved in Farm Bureau throughout the years. He estimates that his father became a member in 1919, two years after Farm Bureau was founded, and that the family maintained their membership through the 80’s when they sold their farm. Bollinger was on the committee that was responsible for purchasing the building at 3589 Westwind Blvd., and he was also the Chairman for the Cunningham farm center for numerous years. Bollinger spent a lot of time throughout his life travelling. He visited places all over the country to attend veterans’ reunions in addition to travelling with friends and family for leisure. Bollinger was also passionate about covered bridges, and traveled the state of California to find them. Bollinger took photos of the bridges and cataloged where they were, producing multiple books with his own photos and descriptions of the covered bridges. 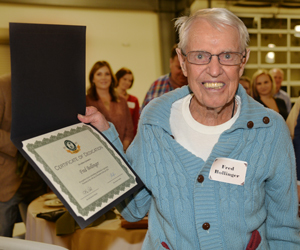 Bollinger celebrated his 100th birthday with more than 150 people and has been recognized by numerous organizations throughout the community. The County of Sonoma also declared October 12th “Fred Bollinger Day”. Bollinger was recognized at Sonoma County Farm Bureau’s annual dinner on November 18th.